Archaeologist uncovering wood at the Star Carr excavation site. Ancient hunter-gatherers living at the Star Carr site some 11,000 years ago in what is now North Yorkshire didn’t skip a beat as temperatures plunged around the globe in the immediate post-glacial era, according to new research published in Nature Ecology & Evolution. This latest research suggests abrupt climate change wasn’t catastrophically or culturally disruptive to this long-standing community, and that early humans were remarkably resilient and adaptable in the face of dramatic climate shifts. Map of the Star Carr lake with excavation sites marked around it. Amateur archaeologists first discovered the Star Carr site back in the late 1940s, and excavations have been conducted there on-and-off ever since. 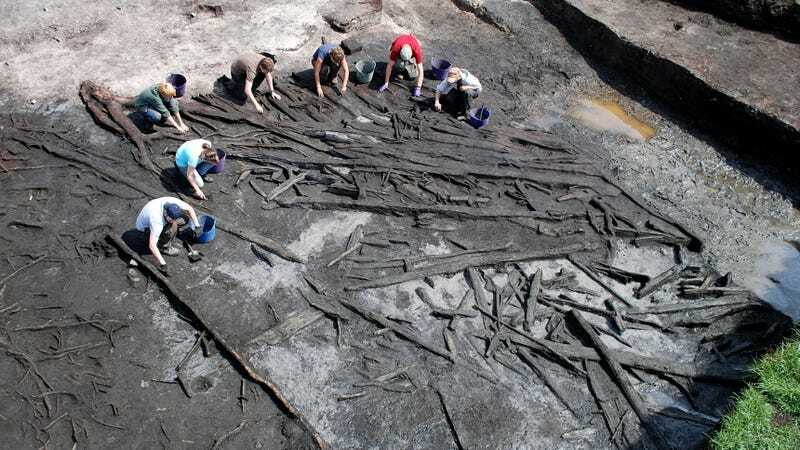 Digging through several feet of muddy peat, archaeologists have uncovered traces of a Mesolithic community that lived continuously around the edge of a former lake for over 300 hundred years starting around 8770 BC. Items found at Star Carr include huge numbers of animal bones and wooden timbers, barbed points, amber and shale beads, decorative antler headdresses, and much more. The Star Carr population arrived in this part of the world at the very beginning of the Holocene Era, which happens to be the era we still find ourselves in. The Holocene started when the Ice Age came to end some 11,500 years ago, but in this transitionary period, the Earth’s climate was still subject to dramatic shifts. In this immediate post-Ice Age era, rising sea levels, changing ocean currents, and frigid ocean temperatures produced prolonged cold periods that rekindled memories of the prior frozen epoch. Average global temperatures dropped by as much as three degrees Celsius, creating cold snaps that lasted more than a hundred years. In parts of the British Isles, Eurasia, and North America, temperatures got so low that entire forests stopped growing. Anthropologists figured early humans living in northern Britain suffered during this time, but the new study suggests this wasn’t the case. “It has been argued that abrupt climatic events may have caused a crash in Mesolithic populations in Northern Britain, but our study reveals that at least in the case of the pioneering colonizers at Star Carr, early communities were able to cope with extreme and persistent climate events,” lead author Simon Blockley, a researcher at Royal Holloway, University of London, said in a statement. The Star Carr site consists of many layers, some of which coincide with the abrupt cooling periods. Digging through the mud, the archaeologists uncovered large numbers of animal bones, flint blades, worked wood, and evidence of wooden houses and wooden platforms built on the edge of the lake. The team taking core samples. The scientists also extracted core samples, digging boreholes to depths of 16 to 26 feet (five to eight meters). Within the sediment, the researches found traces of pollen and some animal fossils, which were used to radiocarbon date the layers. These samples showed that the region experienced two episodes of extreme cooling—one that happened when these Mesolithic humans first moved into the area, and one that happened when they were already firmly established. The researchers expected to see evidence of disrupted or altered activities within the specific layers. And indeed, during the early settlement phase, evidence suggested a period of slowed progress, but the second cooling period had no noticeable effect on the Star Carr community. “Perhaps the later, more established community at Star Carr were buffered from the effects of the second extreme cooling event—which is likely to have caused exceptionally harsh winter conditions—by their continued access to a range of resources at the site including red deer,” said Blockley. This evidence suggests a remarkable level of resilience, adaptation, and likely cooperation, among these early humans. But this community wasn’t completely vulnerable to change. They may have survived severe and abrupt climate change, but they were more susceptible to smaller, localized changes to their environment. Over time, their precious lake got shallower and boggier, eventually turning into a useless marshland. After living along the edge of the lake for hundreds and hundreds of years, the Star Carr people were forced to abandon the area.